Tight end wants to redeem himself for his mistake on fourth down late in the Giants' loss to the Redskins on Oct. 28. For a week and a half, Evan Engram has been sitting on a drop. The one that went through his hands on a critical fourth-down play late in the loss to Washington on Oct. 28. For a number of days after, he said, the play gnawed at him. Now Engram is one of the Giants who is most looking forward to getting back on the field Monday night against the 49ers with an opportunity to wash off that flub. 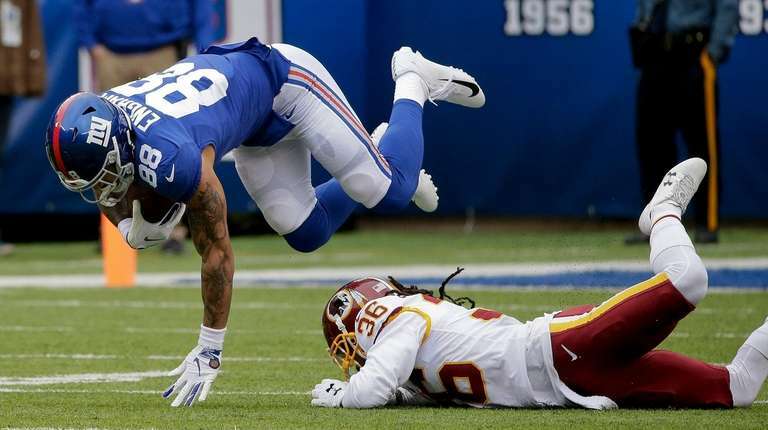 Engram’s two-season NFL career has been peppered with drops. He’s been a productive player, but last year he dropped 11 passes and this year he’s dropped three. “Evan is a pass-catching tight end, I think that’s just the nature of who he is, and it’s important that we catch the ball consistently,” Pat Shurmur said. He also noted that catching is something Engram has been working on – and working on since last year – both during and after practices. He gets another chance at that Monday. Notes & quotes: Shurmur hinted that KR/PR Quadree Henderson, waived this week and re-signed to the practice squad, could be promoted back to the active roster before Monday’s game … New G Jamon Brown is picking up the playbook well and seems to be on a path to start Monday. Shurmur said if that’s the case, Spencer Pulley would remain at center and John Greco, who has played guard and center, would go to the bench … The only Giant who did not practice fully on Thursday was WR Jawill Davis, who was limited with a concussion.